When it comes to academic writing, most professors and editors require students and writers to follow the APA style. The APA writing format is an official style first developed 80 years ago by the American Psychological Association (thus the acronym).The APA style was designed by a group of social scientists who “wished to establish sound standards of communication” especially in the fields of education, and social and behavioral sciences. Since then, the APA style has been adopted in various fields and is continuously used today as a standard for proper academic writing. When writing and submitting an academic paper, your title page is your first impression. A correctly done APA format title page helps establish the aptitude of the student or the writer, and gives the reader and reviewer (either your editor or your professor) a clear representation of the rest of your paper. 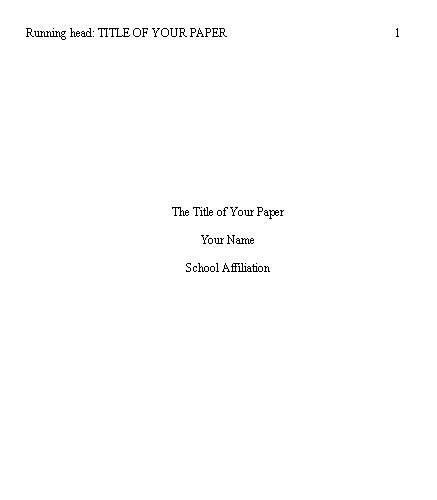 An APA format title pagehas five essential elements: the article title, the author’s name, the author’s school affiliation, the running head and the page number. Typeface or Font. Use Times New Roman, 12-point. Alignment. Do not justify the right margin (make it even); for text use, flush left. Do not divide words at the end of a line and do not use hyphenation. Title. Capitalize major words but not the minor ones. Running Head. Your APA format title page should have a running head. This refers to the abbreviated title printed at each page of your manuscript. It should be no more than 50 characters (including spaces and punctuations). This is the first line of your title page. It should be left-aligned at the top. Byline. Format should be: First name, middle initial, last name. If you have co-writers, include their names as well. Alphabetize according to surname. Institutional Affiliation. This should refer to the organization for which you are writing the paper. If it is an academic paper for a school requirement, type the full name of your school. Page Number. The title page is your first page. The number one (typed numerically as in 1) should be located in the upper right hand corner of the page. Also note that your title, name and school should be centered on the page. Your professor might want to include your class name and number or the due date so it is always wise to check for further instructions aside from the standard elements of an APA format title page. The APA format title page is usually the easiest part of an academic paper so this should be a breeze for most students and writers. As in everything else, when in doubt, don’t hesitate to leave a comment.